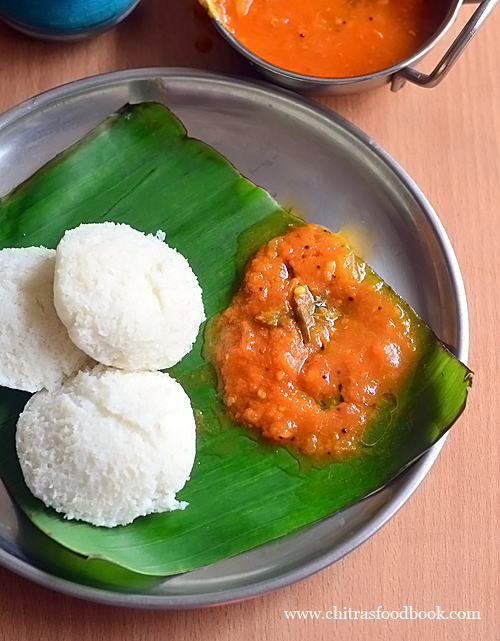 Boiled tomato chutney is an easy, simple chutney recipe for idli, dosa. Its a new recipe to me. As an ardent fan of tomato I keep trying some interesting recipes with it. Recently I came across this boiled tomato chutney recipe (Vendha thakkali chutney) / cooked tomato chutney in my Instagram feed by Mullai (spiceindiaonline). I checked few more versions and tried this recipe from Cookatease. It can be prepared easily in a pressure cooker. All you need to do is to just pressure cook onion, tomato, chilli and garlic. Mash or grind it. Boil and temper. It takes less oil. You can also make it as a no grind version by just mashing the cooked tomato onion mixture. But If you don’t boil the chutney, it may smell raw due to cooked green chillies. So boiling the chutney is mandatory. Even though its my first attempt, it came out so well. I loved it with hot idli more than dosa. If you like, you can make it thick and have it with chapathi too. It reminded my mom’s tomato sambar recipe. This chutney tastes great when drizzled with sesame oil / Nalla ennai. Tomato chutney can be prepared in N number of ways. This is one easy method of making it. Friends, if you are bored of your regular tomato chutney recipe, you can try this boiled version. You will like it for sure. Ok, lets see how to make easy and simple boiled tomato chutney recipe with step by step pictures. Check out my other chutney varieties for idli,dosa. 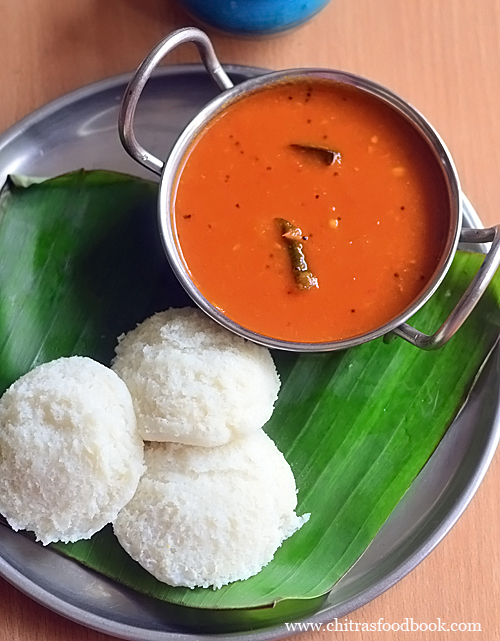 How to make boiled tomato chutney recipe for idli, dosa. 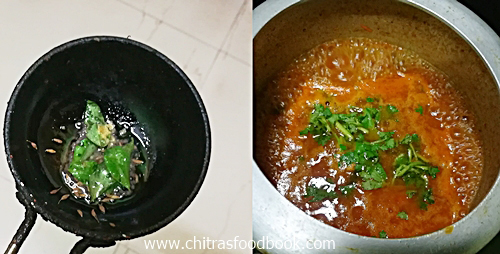 Gingely oil / sesame oil / nalla ennai – to drizzle over the chutney while serving. Wash and chop onion, tomato, green chilli, garlic. In a pressure cooker, take the chopped ingredients. Add turmeric, red chilli powder, salt and water. Pressure cook in low flame for one whistle. Cool down. Mash or grind the chutney. Temper the above ingredients. Add to chutney and boil the tomato chutney for few minutes. Remove when thick. Garnish with coriander leaves. Serve hot with idli, dosa drizzled with gingely oi / nalla ennail. Wash and chop onion, tomato, green chilli and garlic cloves. Chop it roughly if you are grinding it else chop it finely and mash with a ladle after pressure cooking tomato. In a pressure cooker take the chopped ingredients. Add curry leaves, red chilli powder, turmeric powder, salt and water. Mix well and pressure cook. Keep the flame high till vapor starts to come. Put the weight valve. Lower the flame completely and cook for one whistle. Remove the lid after the steam is released. Strain the excess water. Keep aside. Let the tomato cool down completely. Do not grind the tomato, onion when hot. It will splash everywhere. So cool down the mixture completely before grinding. In case you are mashing the tomato, you cam do it when hot. So you can either grind the mixture or mash it with a ladle. Its your choice. I ground the tomato to a smooth paste. You can grind it coarsely if you like. Add the ground tomato paste to the strained water. Mix well. Temper mustard seeds, urad dal, cumin seeds, hing and curry leaves. Add to the chutney. Boil the chutney for few minutes till thick. Garnish with coriander leaves. Remove and serve with idli, dosa. Do not forget to drizzle the chutney with gingely oil/ nalla ennai for best taste ! Enjoy. Adjust the quantity of chilli as per your taste. But I will suggest you to add more chill powder or red chillies instead of green chillies to avoid raw smell. Pressure cooking and mashing the tomato mixture gives a different taste than grinding the tomato. Garnishing with coriander leaves is optional. For variations, you can skip cooking curry leaves along with tomato. You can boil the chutney till oil separates. It stays good for more than a week when refrigerated. 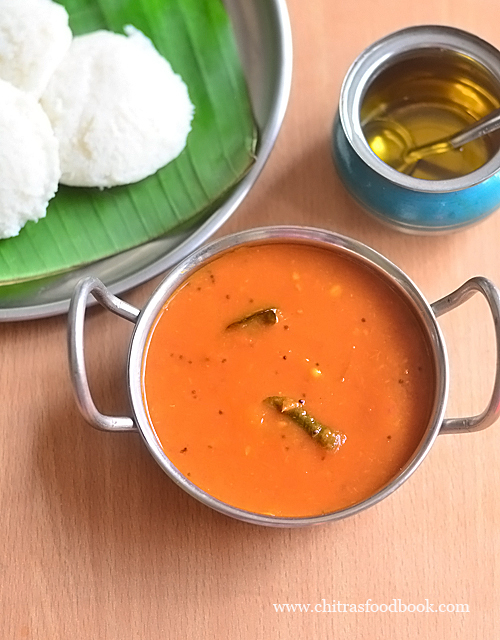 Try this interesting boiled tomato chutney recipe and enjoy with hot idli and dosa ! Rather than boiling onion, tomato and garlic, fry these three and then make a paste. This will come out as delicious chutney! Hi, I have already tried and posted that version. This tastes different. Try it once !